Fun animal bunny ears headband made from 14 pt. high density white paper board, liquid laminated for a high gloss finish. 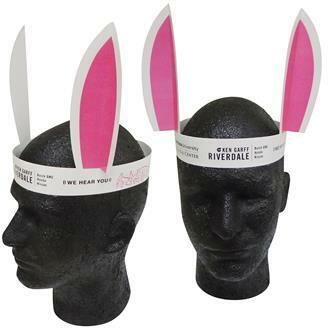 Sure to make an impact at any party or event, animal hats provide high visibility to get your custom message noticed. USA made. Shipped flat with minimal assembly required. Quick turn, just ask! Note :Price includes pre-printed stock graphic, plus one color imprint. Warning - CHOKING HAZARD - Small parts. Not for children under 3 yrs.Ships Flat. See general information for complete details.